We know what is happening not sure why it is happening. The “Whale Trust website” says the tail lob or tail slap occurs when the whale extends its tail fluke above the water and slaps it forcibly down on the surface. This can be “right way up”, slapping the underneath side of the flukes on the water, or the reverse, with the whale belly-up slapping the dorsal (top-side) of the flukes on the water. This often, but not always, occurs many (35+) times in a row. As with the other behaviors, the meaning behind this behavior is unknown, but it has been speculated that it may be a way to ward off other whales, or to the contrary, to invite other whales to join a group. The explanation seems clear as mud but is sure exciting to watch. 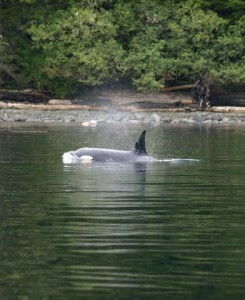 This photo by Gary Wilson was from the area of Telegraph Cove on Vancouver Island. 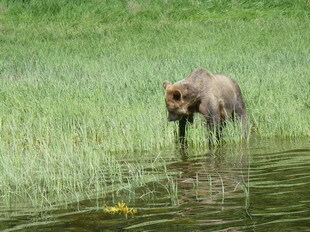 Is photo by Tim O’Neil of a brown bear or a grizzly bear? It’s either or both, because these are common names that have no scientific basis. Grizzly bears received their name because their brown fur can be tipped with white. This gives them a “grizzled” look, especially when blacklit by the sun. All the bears in North America are the same subspecies except one subspecies that occurs in the Kodiak Island. 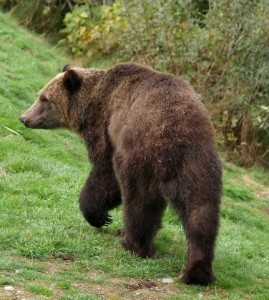 The bears in BC’s rainforest are known as grizzly bears. The Knight Inlet grizzly’s colour ranges from a very light brown which is almost yellow in some bears and almost white in others to a dark brown which may appear black. 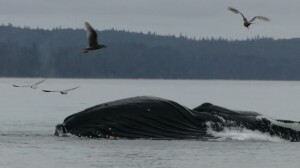 An add on to yesterday’s posting Luwen & Liwen from Singapore have provides an excellent photo of a humpback whale lunge feeding in the waters off Blackfish Sound’s Bold Head a short boat ride from Telegraph Cove on Vancouver Island. 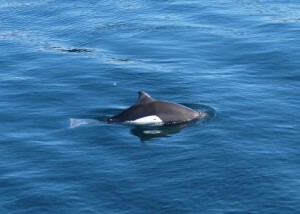 A whale watching trip from the lodge involves a fifty minute boat ride to this area where there is an abundance of marine life including pacific white-sided dolphins, dall’s porpoise, harbour porpoise, harbour seals, steller sea lions, orca, a variety of birdlife including eagles, common murre, surf scooter, rhinocerous auklet, pigen guillemot, marbled murrelet, great blue heron, cormorants, storm petrels, and a large variey of “sea gull”. Added to this is a good chance of seeing a black bear on the way to the area. 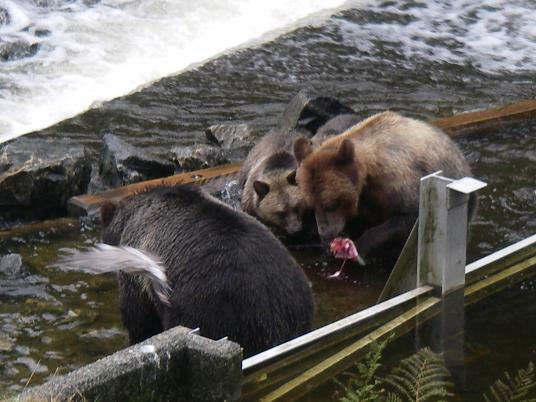 After August 25 the grizzly bear watching takes place from viewing stands on Knight Inlet’s Glendale River. A classic pose after a good catch. A salmon in the mouth is the reasons the bears come to this part of British Columbia’s coast and also the reason we come. Grizzly bear and in this case black bear cubs stay pretty close to mum especially when they are new born or first year cubs. They are not quite in step but never far behind. 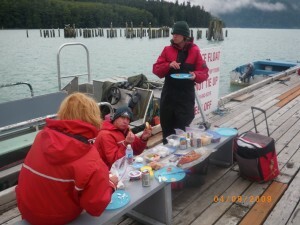 The first photo was taken on one of the “first evening in camp” trips that is normally a guests first boat trip of their stay. 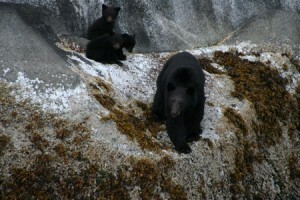 A good low tide and the bears come out to play / eat. 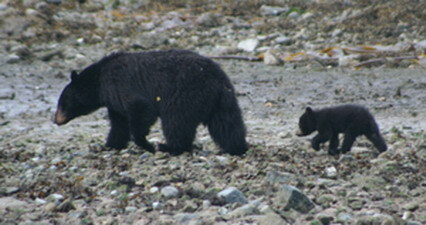 The second photo is from the morning grizzly bear tour up Knight Inlet all safari trips whether for grizzlies or whales often involve black bears in this case a mother and three cubs. 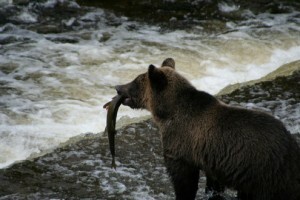 The previous day’s blog show the food grizzly bears eat in the spring. 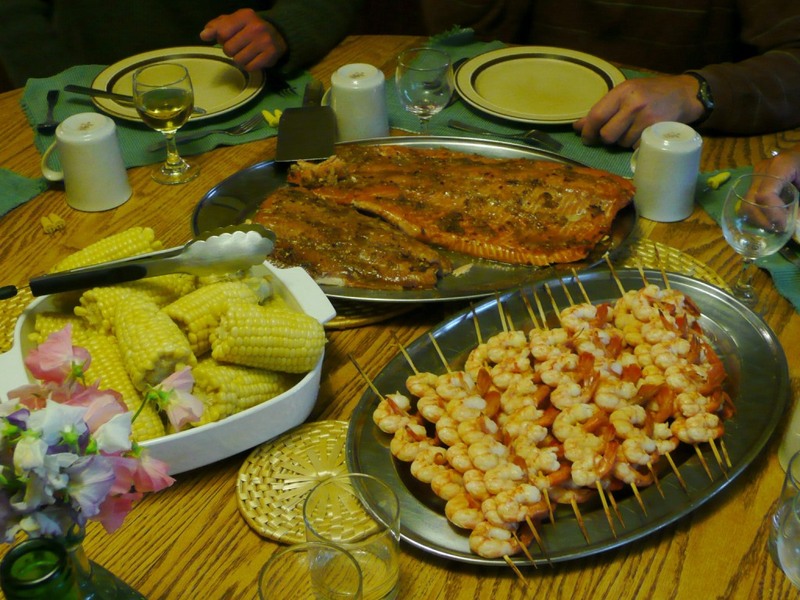 Our guests frequently comment on the quality and quantity of good food provided for meals. From the seafood dinners served by your guides (we are versatile employees) to the self-serve picnic lunches. Although our “wilderness lodge” requires a floatplane flight from Campbell River it does not mean we “rough-it” for meals. 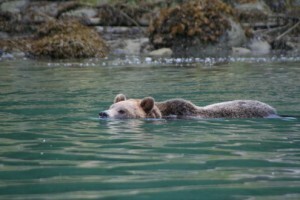 Grizzly bears are great swimmers and are commonly seen in the water in the river estuaries of BC’s Knight Inlet. They swim so well that they have now migrated across Johnstone Strait to Vancouver Island and this is between one and a half to a two-mile swim. 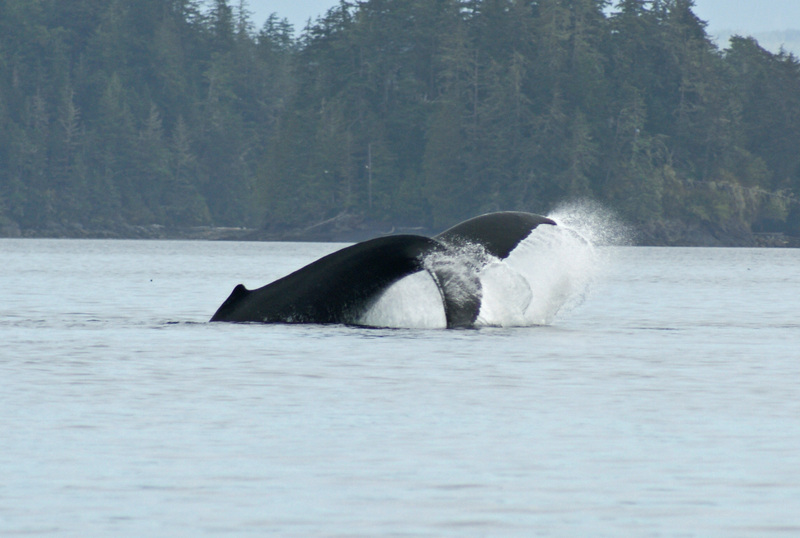 The area biologists but radio collars on ten grizzly bears about eleven years ago and one of them crossed Knight Inlet five times.